I decided to try a one layer card for this sketch, creating the elements only with stamps. The Hero Arts sentiment takes centre stage, framed by a wreath of pretty flowers. I made the leaves with the brush tip of a green Copic marker and I used a black gel pen for the flowers' centres - it gives some great shine and a little 'bump' for dimension. I can't wait to see what you'll come up with - don't forget to link up by the deadline - next Tuesday at noon! OMG! This is so perfectly sweet! Love the colors but ABSOLUTELY love how you tucked the sentiment into the flower wreath! Makes me want to put on a nice breezy gauze dress, with a wreath of wild flowers perched atop my head and dance barefoot in the grass! Yep, the hippie days...of which you are far too young to remember! Must be one of my favorite creations of yours Ardyth. Perfect placement ... love your wreath of little flowers. How clever you are to create your own leaves for the dainty flowers! I love the soft, spring colors with your CAS design...Beautiful card! I just love this sweet little wreath Ardyth! I just saw this on CASE this sketch and had to pop by and tell you how much I love it, the circle of flowers framing the sentiment is fabulous! Ardyth, I adore this sweet floral wreath! So delicate and colorful! Love the bright flowers fitted around the sentiment! Fresh and fun! I love the simplicity of the wreath with all of the colors. So pretty! I love those delicate little flowers circling the sentiment. So sweet! Love those sweet little flowers. Sigh ... sooo lovely, Ardyth, gorgeous colours, love the placement of the sentiment amid all those gorgeous blooms! Ardyth, this is so pretty and so perfect for Mother's Day! 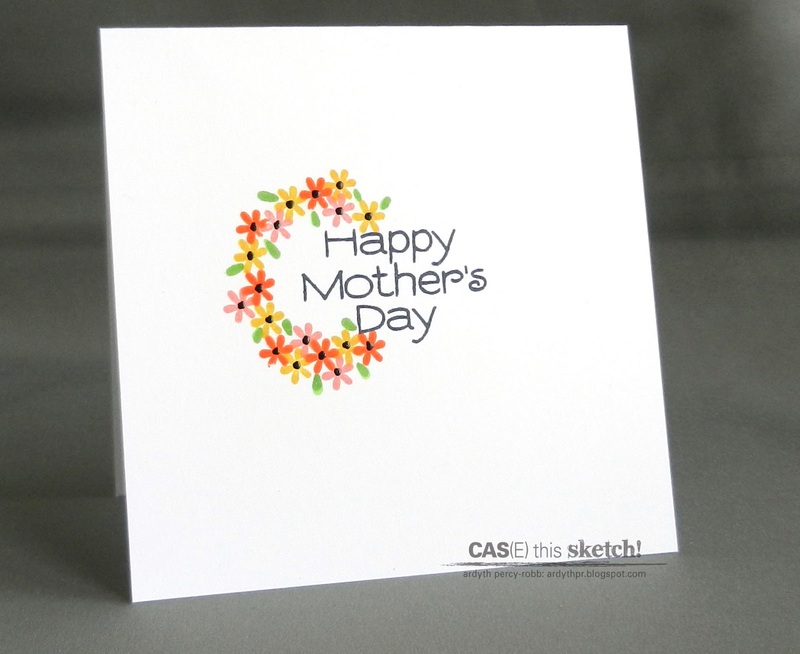 I love your circle of flowers, they are so cheerful and perfect for any mom! Fantastic one-layeredness here! You nestled the flowers perfectly around the "H", "a" and "D".